Lean management philosophy has been successfully applied across many industries – from manufacturing to healthcare, financial services, and construction. Recently, interest in Lean has steadily increased in the education sector as it was originally introduced in that area’s administrative and support processes. Currently, however, the introduction of Lean and its potential in education is gaining wider exposure because of the massive changes looming -- For example, the introduction of technology in education (as EdTech within the traditional system and as MOOCs), demographic changes, budget pressure, the entrance of more and more private providers, and changing demands of society and industry on the curriculum. What is missing is a joint framework that will allow schools, teachers, directors, and boards to either integrate these developments or choose between them and then execute a successful strategy. Lean offers the potential to streamline the execution of strategy and teaching and to accelerate the development of new courses and studies that are closely aligned to the needs of students as well as the integration of new technologies without overburdening teachers and staff. The key to this plan is to empower teaching and research staff put teaching and research first and then to align Lean thinking and pedagogy. 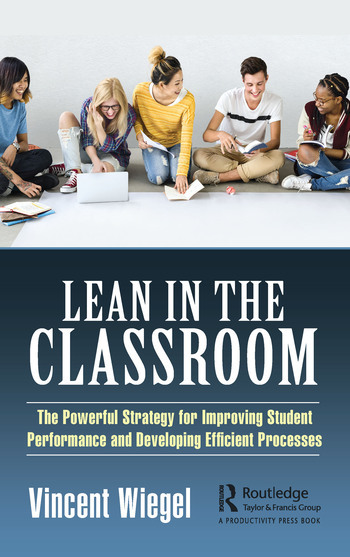 This book defines Lean education in all its aspects: course design, actual teaching and learning processes, school management, and the organization of supporting processes. It is firmly based on the Lean management philosophy in conjunction with pedagogy. The book draws in both scientific research in the field of Lean management in general and Lean education in particular. In addition, it is predicated on many years of hands-on experience applying Lean both inside and outside education. Introduction – Why Lean Education. PART I – Lean and Education. PART II – Lean in the Classroom. PART III – Teaching and support processes. PART IV – Hands-on: Cases and Best Practices. Vincent Wiegel -- Professor of Lean and World Class Performance at HAN University of Applied Science, The Netherlands -- is one of the leading experts in the field of Lean in the Netherlands and founder of and professor at the Research Group for Lean & World Class Performance. As a professor, Vincent Wiegel is involved in Lean education and initiates research into the effectiveness of Lean implementations. Besides his wide range of general knowledge and experience, his specific expertise is in Lean product development, Lean in non-manufacturing environments and use of Lean in the healthcare sector. He is both an economist and a philosopher, and as a professor he encourages businesses to develop Lean capability and use that capability to drive continuous improvement. He applies his expertise at a range of different types of organisations, those that offer financial services or produce fast-moving consumer goods, healthcare institutions, educational institutions and in the manufacturing industry. His experience with applying Lean covers the full scope from the factory floor to the boardroom, and from SMEs to multinationals. Restructuring processes -- Restructuring processes are needed to apply Lean at businesses, particularly at SMEs. A vital factor is a thorough and comprehensive approach involving strategy definition, process improvement and operational control. As part of the Lean & World Class Performance Research Group, Vincent Wiegel initiates research into the effectiveness of Lean implementations, particularly at SMEs and educational and healthcare institutions, by having those institutions work together with other knowledge institutes, lecturers, researchers and graduating students. He is also closely involved in the development of Lean education at HAN. Quick Response Manufacturing (QRM) -- Besides his position as professor, Vincent Wiegel is director of the European centre for Quick Response Manufacturing (QRM) and partner in Volant Groep, an organisation that scouts and recruits Lean talent. They work together with that talent and experienced Lean experts to help organisations develop lasting Lean capabilities.